Originally started as supper clubs back in the 1960s, pop-up restaurants have seen a resurgence. Just as their name implies, pop-ups often occur in unexpected places, for a limited time. Many chefs open a pop-up restaurant as a way to showcase their talents to a wider audience, perhaps drawing in investors for a restaurant in the future. Other pop-ups are a test run by would-be restaurateurs who are thinking of opening their own restaurant. Pop-ups are also used by community groups as fundraisers. Some pop-up proprietors seek to offer high-quality food at more affordable prices, allowing more people access to gourmet dining. Due to the limited menu choices of most pop-up restaurants, foodies are the typical audience. These are people who enjoy trying new, sometimes unusual, foods. Many pop-ups advertise by word of mouth or by invite only, catering to people who appreciate specialty dining. The beauty of the pop-up restaurant is that it can open almost anywhere. As long as the space is safe to cook and serve food, it can be a pop-up restaurant. Pop-ups have been hosted in empty warehouses, rooftop gardens, or in an old barn, just to name a few places. Another option for a pop-up restaurant location is an already existing restaurant. For example, renting a diner that serves only breakfast and lunch. The owners of the diner receive a percent of the profits to cover water, sewer, electricity, gas, and any other associated expenses. The benefit of hosting a pop-up restaurant in your own restaurant is the novelty that brings in extra customers. While far cheaper than a traditional brick and mortar restaurant, a pop-up restaurant will still cost several thousand dollars to open. The final cost will depend on the size of the pop-up and the amount of equipment needed. 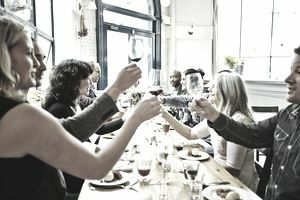 People go to pop-up restaurants to experience a unique, creative eating experience. Therefore, your pop-up restaurant menu should be original—something you can’t find at any local eateries. Due to the limited nature of most pop-up kitchens, a prix fixe menu or limited menu is ideal. Some pop-up restaurants offer a five, six, or seven-course meal—no choices allowed. A pop-up restaurant is a lot like catering a large event, except that it goes on for days, weeks or even months. You need to plan the logistics carefully. For example, how are you going to keep food warm and/or cold before and during the dinner rush? Other logistics to consider is the transportation of supplies and equipment and knowing how much food to buy for each night. Alcohol presents another problem, depending on which state you are doing business. Some places it is easy to apply for a temporary liquor license, while others it is nearly impossible. Check with your local state office to find out if your pop-up restaurant is eligible for a liquor license. If it isn’t, or if you’d rather not deal with the hassle of serving alcohol, you can allow guests to bring their own alcohol with them- again checking with local authorities that it is allowed. Pop-up restaurants are temporary in nature. They can last for an evening, a week, or even a month. It all depends on how long the space is available and the purpose of the pop-up. For example, a pop-up for a fundraiser may last for only a weekend. A pop-up as a trial run for a traditional brick and mortar restaurant could last several weeks. Think of the traditional bean supper at local grange halls or spaghetti dinners to benefit a local sports team or other charitable cause. These are essentially pop-up restaurants in their most basic form. A pop-up restaurant takes this basic concept and steps it up to a more traditional restaurant atmosphere. One of the coolest aspects of a pop-up restaurant is that it may be located in an unusual location, like an apartment building rooftop, an old barn, or even an empty airplane hangar. Wherever there is room for tables and chairs and a makeshift kitchen, you could host a pop-up restaurant. Just be sure that you have permission to use the space and it is safe for staff and customers (more about that in a second). While maybe not as cool as an airplane hangar or a city rooftop, an existing restaurant makes planning a pop-up a whole lot easier. If a restaurant is only open for breakfast and lunch, it could double as a pop-up restaurant in the evening. Truly underground pop-up restaurants don’t usually bother with licenses or insurance. However, you need both to be legal and to avoid any potential legal trouble if problems should arise. Check with your local town or state authorities about what types of temporary permits you’ll need before you open. Like food trucks, many pop-up restaurants use social media as their primary means of advertising. Nightly specials are posted on sites like Facebook and Twitter. Invites to your pop-up may be issued exclusively through social media sites. First and foremost, you pop-up location should be safe for patrons and safe to serve food. If electricity and running water aren’t readily available, you need to make sure you have access to both for extended periods of time. Food needs to be kept in the safe temperature zones for hot and cold, to avoid any possible food poisoning. Some professional chefs open their own pop-ups to build their culinary reputation since the short-term nature of a pop-up allows chefs total freedom and creativity in the kitchen. Others open a pop-up restaurant to test out a restaurant concept, using it as an avenue to entice investors as well as the public to try it out. Most people who go to a pop-up restaurant are looking for a food adventure—something new, unique, and creative. Something that is different from the local restaurant scene. Add to this a limited amount of space for storage and cooking and most pop-up restaurants feature a prix fixe menu of some sort. Instead of a la carte menu, providing a prix fixe menu allows you to charge a set amount per person. Depending on the length that your pop-up restaurant is open, you may change the menu every night or every few nights. Pop-ups are low commitment. You don’t have to mortgage your house or even quit your day-job. They offer a chance to do something different and see if the restaurant business is something you want to pursue in the future.